Hamzeloo-Moghadam, M., Khalaj, A., Malekmohammadi, M., Mosaddegh, M. (2015). Achillea vermicularis a medicinal plant from Iranian Traditional Medicine induces apoptosis in MCF-7 cells. Research Journal of Pharmacognosy, 2(1), 1-5. M. Hamzeloo-Moghadam; A. Khalaj; M. Malekmohammadi; M. Mosaddegh. "Achillea vermicularis a medicinal plant from Iranian Traditional Medicine induces apoptosis in MCF-7 cells". 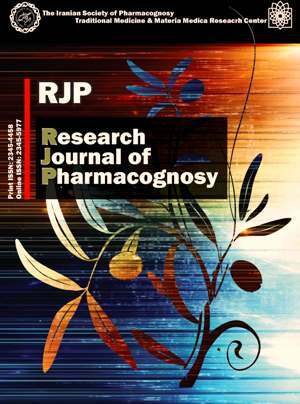 Research Journal of Pharmacognosy, 2, 1, 2015, 1-5. Hamzeloo-Moghadam, M., Khalaj, A., Malekmohammadi, M., Mosaddegh, M. (2015). 'Achillea vermicularis a medicinal plant from Iranian Traditional Medicine induces apoptosis in MCF-7 cells', Research Journal of Pharmacognosy, 2(1), pp. 1-5. Hamzeloo-Moghadam, M., Khalaj, A., Malekmohammadi, M., Mosaddegh, M. Achillea vermicularis a medicinal plant from Iranian Traditional Medicine induces apoptosis in MCF-7 cells. Research Journal of Pharmacognosy, 2015; 2(1): 1-5. 2Department of Traditional Pharmacy, School of Traditional Medicine, Shahid Beheshti University of Medical Sciences, Tehran, Iran. Department of Traditional Medicine, Faculty of Medicine, Alborz University of Medical Sciences, Karaj, Iran. 3Department of Plant Sciences, School of Biology, College of Sciences, University of Tehran, Tehran, Iran. 4Traditional Medicine and Materia Medica Research Center, Shahid Beheshti University of Medical Sciences, Tehran, Iran. Department of Traditional Pharmacy, School of Traditional Medicine, Shahid Beheshti University of Medical Sciences, Tehran, Iran. Background and objectives: Achillea is an ancient medicinal herb. The genus comprises about 100 species which are mostly distributed in northern hemisphere and some have been investigated for different biological activities. There are also several reports in Iranian Traditional Medicine (ITM) texts about its anti-tumor effect. The cytotoxic activity of the methanol extract of Achillea vermicularis Trin. has been reported in previous studies against different tumor cell lines. Based on these reports, the species has been further investigated for apoptosis induction ability. Methods: The apoptosis induction ability has been evaluated through activated caspase 3 investigation in intact MCF-7 cells in vitro. Results: The assay demonstrated signs of caspase 3 activation in MCF-7 cells. Conclusion: Achillea vermicularis is suggested for further mechanistic evaluations in apoptosis studies. Zhang Q, Lu Z, Ren T, Ge Y, Zheng Y, Yao D, He X, Gu Y, Shi Q, Huo C. chemical composition of Achillea alpina. Chem Nat Compd. 2014; 50(3): 534-536. Beck LY. De Materia Medica. Hildeshiem: Olms-Weidmann, 2005. Ghasemi Y, Khalaj A, Mohagheghzadeh A, Khosravi A. Composition and in vitro antimicrobial activity of the essential oil of Achillea eriophora. Chem Nat Compd. 2008; 44(5): 663-665. Cho WCS, Ed. Materia Medica for Various Cancers. London: Springer, 2011. Kundaković T, Stanojković T, Juranić Z, Kovacević N. Cytotoxic and antioxidant activity of Achillea alexandri-regis. Pharmazie. 2005; 60(4): 319-320. Naghibi F, Khalaj A, Hamzeloo-Moghadam M. Cancer terminologies used in the medieval texts to the early modern Iranian Traditional Medicine (ITM). Res Hist Med. 2014; 3(2): 63-72. Aggarwal BB, Danda D, Gupta S, Gehlot P. Models for prevention and treatment of cancer: problems vs promises. Biochem Pharmacol. 2009; 78(9): 1083-1094. Lanzotti V, Taglialatela-Scafati O, Fattorusso E, Di Pietro A. plant compounds and derivatives as inhibitors of cancer cell multidrug resistance, in Bioavtive compounds from Natural Sources. Tringali C, Ed. Boca Raton: CRC press, 2011. Hanahan D, Weinberg RA. Hallmarks of Cancer: the next generation. Cell. 2011; 144(5): 646-674. Cotter TG. Apoptosis and cancer: the genesis of a research field. Nat Rev Cancer. 2009; 9(7): 501-507. Letai AG. Diagnosing and exploiting cancer's addiction to blocks in apoptosis. Nat Rev Cancer. 2008; 8(2): 121-132. Werner JM, Steinfelder HJ. A microscopic technique to study kinetics and concentration–response of drug-induced caspase-3 activation on a single cell level. J Pharmacol Toxicol. 2008; 57(2): 131-137. LeBlanc AC, Ed. Apoptosis techniques and protocols. Totowa: Humana Press Inc, 2002. Logue SE, Martin SJ. Mammalian caspase activation pathways in apoptosis and inflammation. In: O’Brien T, Linton SD, Eds. Design of caspase inhibitors as potential clinical agents. Boca Raton: CRC Press, 2009. Cragg GM, Kingston DGI, Newman DJ. Anticancer Agents from Natural Products. Boca Raton: Taylor & Francis, 2005. Brunton LL, Chabner BA, Knollmann BC. Goodman and Gilman's manual of pharmacology and therapeutics. New York: McGraw-Hill Professional, 2008. Cragg GM, Newman DJ. Natural products: A continuing source of novel drug leads. BBA-Bioenergetics. 2013; 1830(6): 3670-3695. Teng H, Zhang ZG, Wang L, Zhang RL, Zhang L, Morris D, Gregg SR, Wu Z, Jiang A, Lu M, Zlokovic BV, Chopp M. Coupling of angiogenesis and neurogenesis in cultured endothelial cells and neural progenitor cells after stroke. J Cereb Blood Flow Metab. 2008; 28(4): 764-771. Vázquez-Nin GH, Escobar ML, De Felici M, Echeverría OM, Klinger FG. Cell Death in Mammalian Ovary. London: Springer 2011. Porter AG, Jänicke RU. Emerging roles of caspase-3 in apoptosis. Cell Death Differ. 1999; 6(2): 99-104.